In India, progress on key health targets for maternal and child mortality has been slow. The 2015 United Nations Millennium Development Goals Report found that “poor data quality, lack of timely data and unavailability of disaggregated data” is a key challenge to India’s development policymaking. The national and state-level governments recognize the need for strengthening their health information systems to better track health services and health outcomes, and to support evidence-based decision-making to improve service delivery, especially for women and children. A first step to improving the health information system is assessing the state of health data to identify inaccuracies and shortcomings in collection and reporting systems. To support India’s efforts to improve their health data quality, the HFG project trained state officials in Haryana and Punjab—two USAID-priority states—to use the MEASURE/Evaluation Routine Data Quality Assessment (RDQA) methodology. 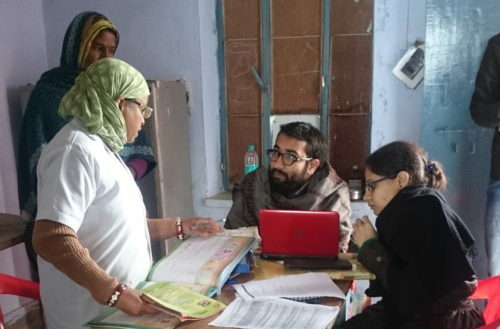 In Haryana, HFG collaborated with the state’s National Health Mission to conduct two rounds of data quality assessments, which involve visiting health facilities to audit data records and examining structures of state, district, and facility-level health information systems. Both states now have the tools they need to assess the weaknesses of their health information systems and design appropriate interventions to improve data quality. To ensure that Haryana state acquired the skills and knowledge needed to conduct future assessments, HFG also trained 42 district officials (two from each district) in the new methodology. District-level monitoring and evaluation (M&E) officers joined the HFG team to carry out data collection during round two of the exercise. In Punjab, HFG provided similar training sessions to all 22 district M&E officers, equipping them with the necessary skills and information to carry out assessments. The efforts to institutionalize data quality assessments through capacity building are already yielding positive results in Punjab. Following the training, the number of monitoring visits by M&E officers to service delivery points jumped from 54 in the April–June 2015 quarter to 96 and 91 in the following two quarters. The quality of data collected has also improved. At the regional HMIS workshop conducted by the Indian Ministry of Health and Family Welfare in Dehradun in February 2016, Punjab officials presented the RDQA as a best practice.